Our weekly meeting is every Saturday in Seelye 208, from 4:30 to 5:30. We also unofficially eat in the Cutter/Ziskind dining hall at almost every meal-- everyone is welcome to join us! If you like SSFFS, make sure to check out Conbust! SSFFS stands for the Smith Science Fiction and Fantasy Society. It is pronounced like Sisyphus (no relation to the mythical figure). 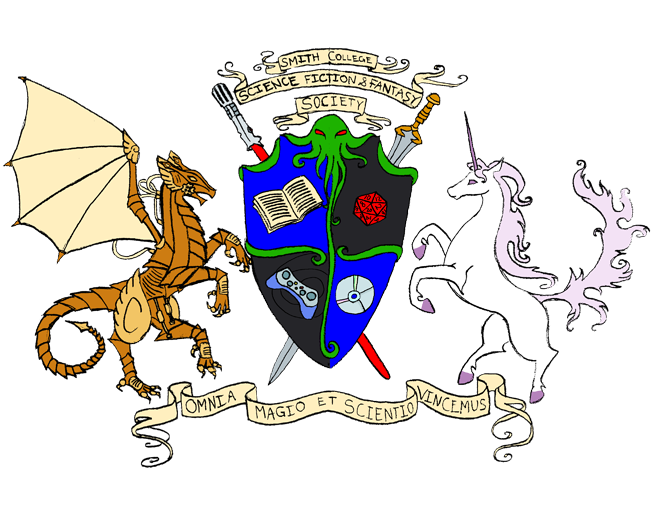 We are a college group, committed to introducing our campus to a variety of geekery including (but not limited to): Sci-Fi, fantasy, anime, gaming, and fiction writing. Our meetings are every Saturday at 4:30 in Seelye room 208. We hang out, play games, and generally geek out. This year is our 38th year of operation, making us one of the oldest "cultural" organizations on Smith campus. Our events run the gamut from fund-raising bake sales to LARPs (live action role playing), to weekly Friday meetings, to off-campus get togethers. Site last updated: March 13th, 2019.